Carol Greider, along with Elizabeth Blackburn and Jack Szostak, won the 2009 Nobel Prize in Medicine for the discovery of telomerase, an enzyme that plays an important role in the division of cells, and which has a real potential to fight cancer and age-related diseases as well. 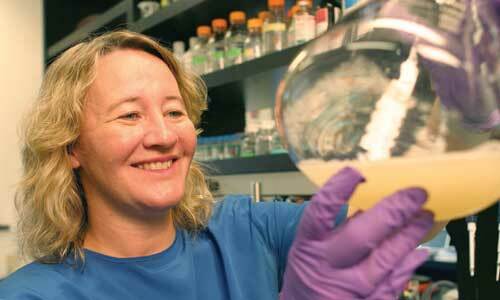 Greider also won the 2006 Albert Lasker Award, one of the most respected prizes for work in the sciences. Dr. Carol Greider is one of the three winners of the 2009 Nobel Prize in Physiology or Medicine, joining just eleven other women in winning the Prize since its inception in 1901. Greider has never seen her gender as an obstacle; but in her early years of schooling, as well as in graduate school admissions, there was one obstacle to overcome: her dyslexia. Reflecting on her journey through standardized tests, the school selection process, and overcoming dyslexia’s challenges, Greider shares that, “If U.C. Berkeley had done the same thing that many of the other schools did, which was to apply a cutoff, then I wouldn’t have gone to graduate school and made the discovery of telomerase and won the Nobel Prize.” Dr. Greider and her colleagues continue to study telomeres at her lab at Johns Hopkins. “Carol’s profoundly important work, its impact on science and its increasing implications for human health exemplify the Johns Hopkins mission in advancing knowledge for the sake of our world,” says Edward D. Miller, M.D., Dean and CEO of Johns Hopkins Medicine. When Maggie Aderin-Pocock was a very young girl, she loved looking up at the stars in the sky, and she loved a British television stop-animation series about mousy-looking beings from another planet called The Clangers. It’s debatable as to which inspired her dream of becoming a space scientist more, but one thing is sure: the passion Maggie had for space ignited a career and helped her overcome her dyslexia. Jack Horner dreamed of becoming a paleontologist and of making contributions that would help our understanding of dinosaurs as living creatures. Because of his poor grades Horner knew that achieving this goal by getting a Ph.D. would be close to impossible.